Greetings Casineros & Dancing Familia! Want to ring in the new year dancing to timba and all forms of Cuban music? That's right mi gente! 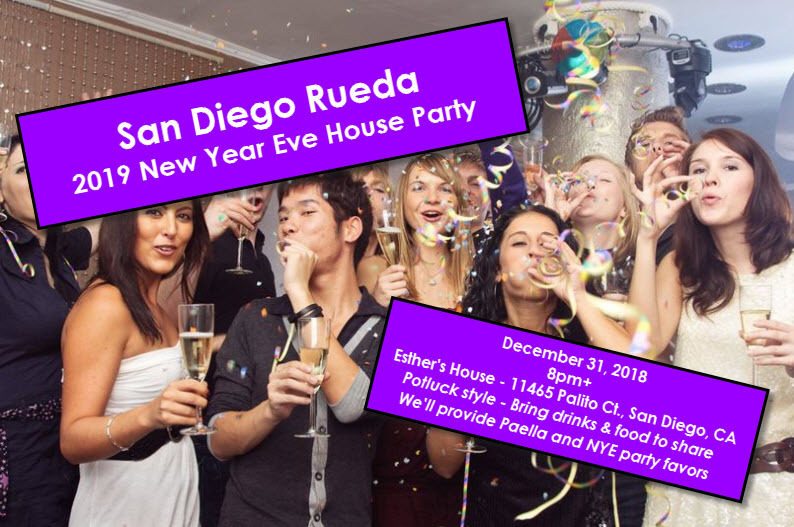 Thanks to our dancing friend, Esther Bartolome, from Maritza's rueda class, she has graciously offered her home for a NEW YEARS EVE TIMBA HOUSE PARTY!! 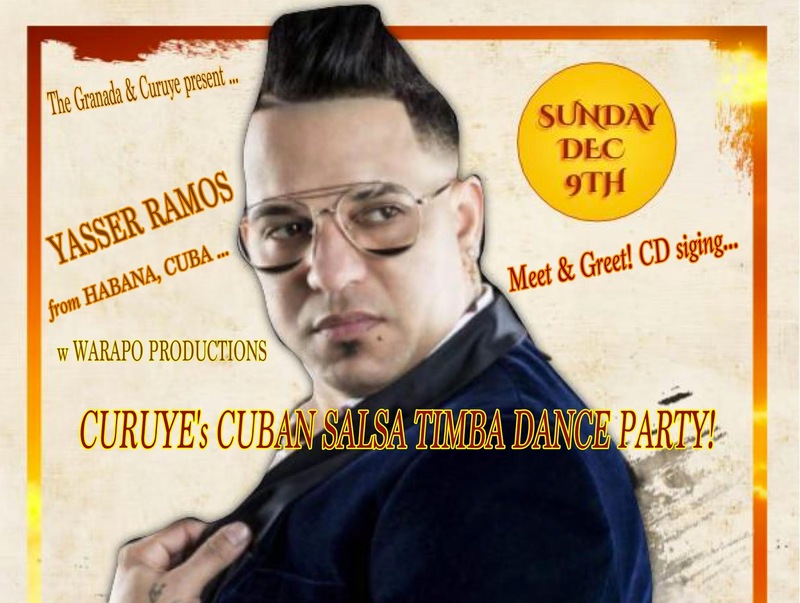 Let's ring in the new year Cuban style, with timba, son and Cuban reggaeton music. HOW TO PREPARE: Bring drinks to share (Your favorite rum, vodka, whiskey, tequila, beer, wine, and non-alcoholic drinks. (We'll be making some virgin Mojito mix and provide some rum and coke for Cuba Libres). More rum is welcome! I will also have Blood Orange Sparking Soda( non-alcoholic) for the non-alcohol drinkers and I will also have a pomegranate sparkling soda mix as well. You can mix some rum or just drink as is. ft YASSER RAMOS, from La Habana Cuba! WELCOME YASSER RAMOS, direct from La Habana, who will be appearing THIS SUNDAY, DECEMBER 9 at CURUYE’s CUBAN SALSA TIMBA DANCE PARTY! Though his band will not be coming to the U.S. until next month for the L.A. debut concert of YASSER RAMOS & El TUMBAO MAYOMBE, during this Sunday’s party you can personally meet and greet YASSER, and have him sign LA RESISTENCIA, his new cd, produced by WARAPO PRODUCTIONS! DEEJAY WARAPO will be playing cuts from the new cd throughout the night! CURUYE will be raffling a few of the CDs at the beginning of the party, and also a pair of tix for YASSER RAMOS & El TUMBAO MAYOMBE’s January debut concert! WARAPO will not only be playing the latest hot dance tunes for our dancing pleasure, but celebrating his birthday month along with CARMEN LUCERO, CHIQUITA FLOWERS, and other December birthday peeps. Send Curuye a message if you’d like to be celebrate your December birthday! 5:30 pm: Cuban dancer KATI HERNÁNDEZ will be kicking off the party with a AFRO TIMBA—Cuban freestyle—class, so come early! CHEF ISRAEL will be whipping out tasty dishes for hungry dancers through 9 PM, so plan a to have a meal with your friends. $10 cover includes dance class! Free parking in structure across from the Granada! LET’s SHOW YASSER that L.A. LOVES TIMBA & HIS NEW CD! HOW TO PREPARE: Bring drinks to share (Your favorite rum, vodka, whiskey, tequila, beer, wine, and non-alcoholic drinks. (We'll be making some virgin Mojito mix and provide some rum and coke for Cuba Libres). More rum is welcome!